Run by retired Police Officer, Glenalmond Guest House is a beautiful 100 year old 'turn of the century' house which maintains many of its Edwardian features, such as the ornate pitched pine staircase. The current owners, Frank and Marion Austin have owned the house since 2001. Situated near the small town of Horley, Glenalmond provides overnight accommodation near Gatwick Airport, close to local shops, restaurants, pubs, and mainline stations. Lakeside Continental Hotel was the last hotel opened in the collection of our contemporary 3* hotels on the 2nd of June 2001. The Lakeside Continental Hotel has its rightful position as one of the most modern and comfortable hotels in Frimley Green, Surrey. Our warm and friendly atmosphere plays host to thousands of visitors every year from the individual business traveller, family weekend breaks and of course, private functions to include weddings through to corporate entertaining. This 15th-century inn offers B&B accommodation, free wireless internet and a gastro-pub restaurant serving good home-cooked food, all in the lovely village of Ockley. 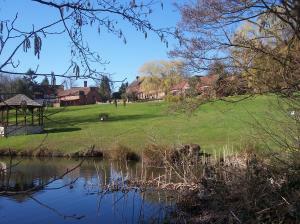 Ockley is 15 miles (24 km) from Gatwick and 8 miles (13 km) from Dorking. The Inn on the Green has a modern outlook combined with a traditional oak-beamed bar that is full of character and often hosts live music. To the rear of the pub is a very comfortable lounge area with sofas and an open fire. There is a separate games room with pool table and fruit machine. This privately owned hotel is nestled in 22 acres of Surrey countryside and offers relaxed luxury and a high standard of service. Lythe Hill Hotel and Spa has recently completed a large GBP 1 million refurbishment of the main building, the bedrooms, some public areas and the main function rooms. Enjoy the award-winning restaurant and the superb spa facility with swimming pool, steam room, cold temple shower, sauna, a fully equipped gym and 4 treatment rooms. Nestled amidst 20 acres of listed grounds, within the 300 acre Wotton Estate, this grand country house is beautifully located on the outskirts of Dorking, in the heart of Surrey. Providing peaceful surroundings, just 40 minutes by train from London, Wotton House is well situated for exploring the Surrey Hills and the old market towns of Dorking and Guildford. If you prefer to stay closer to home, the hotel itself boasts outdoor and indoor activities, including walking and jogging paths, an indoor swimming pool and fitness centre. Once the family home of diarist John Evelyn, this historic property has been meticulously converted and extended, making it a renowned venue for business and leisure, within easy reach of the M25, Heathrow and Gatwick. Jacobean style manor house set in 22 acres of park land. Close to 12 million pounds has been spent refurbishing our hotel, be one the first to stay in it. Ideal for conferences and banqueting with superb and flexible facilities. Conveniently located for Windsor, Legoland, Thorpe Park. London and Heathrow, 5 minutes from the m25. 22 acres of lawns and woody grounds, ensuring a tranquil and secluded setting and a perfect location for outdoor events of all types. The hotel is non-smoking. This Victorian house offers free Wi-Fi, tasty breakfasts and, after check-out, transfers to London Gatwick Airport (1.5 miles / 2.5 km). 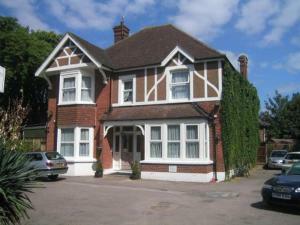 Masslink Guest House offers comfortable bed-and-breakfast accommodation within 5 minutes' drive of Gatwick Airport. A small number of on-site parking spaces are available. All of Horley's restaurants, cafes, pubs and shops are within easy walking distance. Horley Railway Station is just 10 minutes' walk away, with regular direct trains to London, Brighton and the South East of England. All rooms have TVs, hairdryers, tea/coffee and radio alarm clocks. Rooms have either en suite or shared bathrooms. A full English breakfast is available, Monday to Friday with a light breakfast available at the weekends and for early travellers. This hotel is part of the historic Beaumont Estate, with a leisure club, free parking and 40 acres of gardens in Old Windsor, 5 minutes from the M25 and 15 minutes from London Heathrow Airport. Beaumont House is on the Berkshire/Surrey border, ideal for trips to London, Henley-on-Thames, Wentworth, Ascot, Royal Windsor, Thorpe Park, Savill Gardens, the RHS Wisley Gardens and Runnymede. A 2-minute stroll from the River Thames, Beaumont House can help you book a river cruise. Beaumont Estates leisure club has a heated indoor pool, gym and all-weather tennis courts that are free for you to use. All bedrooms are spacious and comfortable. There are family rooms, and during the summer and school holidays both DVD rooms and play areas are available for children. 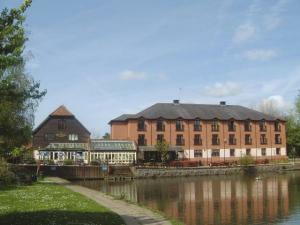 With free parking, this hotel in Chertsey has wonderful views of the river and out beyond historic Chertsey Bridge. 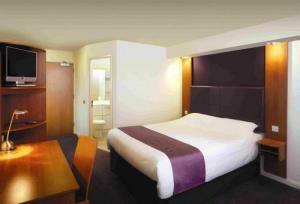 Each room was fully refurbished in 2008, and has a brand-new modern bathroom and a flat-screen TV. The Bridge Hotel is set over 3 floors and has lift access to the rooms. The Bridge Hotel sits beside a small river that flows in the main River Thames. 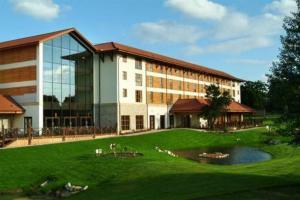 The hotel is 3 miles (4.8 km) from Thorpe Park, and is not far from Legoland, Windsor Castle and Hampton Court Palace. The Bridge Hotel is also convenient for Kempton and Sandown racecourses, Brooklands Museum, Mercedes World and Twickenham RFU. This modern hotel with a stylish, subtle safari theme is located next to Chessington World of Adventures. Holiday Inn London Chessington has state-of-the-art bedrooms with internet access, air conditioning, a desk and power shower. It is an ideal meeting venue, with 6 meeting rooms and easy access from the M25, and Heathrow and Gatwick airports. The hotel is a great for families, with packages including tickets to Chessington World of Adventures. Family rooms have a separate children's sleeping area with a flat-screen TV with popular kids' channels. The extended leisure centre has an 18-metre indoor pool, and luxurious Decleor treatments in the beauty salon. Work out in the modern gym and enjoy the soothing spa facilities including a whirlpool, sauna and steam room. Close by are Epsom and Sandown racecourses, Wimbledon, Hampton Court Palace and Thorpe Park. In 200 acres of quiet, scenic Surrey countryside, the charming Gatton Manor is a complete golf, business and leisure venue, 1 hour from London and 20 minutes from Gatwick Airport. Customer service comes first at this privately owned AA 3-star hotel and golf club. In 2008, Gatton Manor received 3 awards for 'Business Excellence' and 'Customer Service'. Close to Dorking, Horsham Guildford and Cranleigh, Gatton Manor offers a fitness suite with new 'Technogym', cardiovascular equipment and free weights (updated in April 2009). Golfers will love the mature, challenging championship-length golf course, where each hole is different. Cumberland House is 2 miles (3.2 km) from London Gatwick Airport and has a free airport shuttle service between 05:00 and midnight. Free Wi-Fi is available throughout the B&B. Cumberland House is entirely non smoking and has 6 rooms in total. The Ye Old Six Bells pub is a short walk from Cumberland House and has a wide menu for lunches and evening meals. 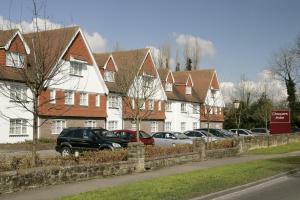 The Skylane Hotel in Horley is conveniently situated just 5 km (3 miles) from Gatwick Airport. This purpose-built hotel offers inclusive airport parking packages, bar and restaurant facilities. The Skylane Hotel is ideal for flying in or out of Gatwick Airport and offers a complimentary bus between 06:00 and 23:45. The hotel offers room only rates and rates to include parking whilst away. With such a central location, the Skylane is ideal for touring London and the South-East of England. Unfortunately, the hotel does not have a lift. In its own beautiful gardens, right in the town centre, within easy reach of Camberley Railway Station and the M3, this large Victorian house offers spacious, high quality accommodation. In a convenient location, Heatherbank offers attractive, homely bed and breakfast accommodation in a relaxed and informal atmosphere, with 2 fully equipped self-catering apartments also available. There are 5 individually furnished rooms, all with tea/coffee making facilities and TVs with Freeview digital channels and DVD players. Camberley is close to Bracknell, Farnborough and Aldershot and is 30 miles (50 km) from London Heathrow Airport. Central London is within easy reach, by train or by road. The Royal Military Academy at Sandhurst is just over a mile away (2 km). Free car parking is available in the beautiful grounds. The Godalming Hotel offers delicious full English breakfasts and beautifully renovated rooms, all with mahogany sleigh beds, wooden parquet flooring, free Wi-Fi and Freeview digital TVs. Tastefully renovated to a very high standard, the Godalming Hotel offers attractive guest accommodation at great-value rates. Each room is tastefully furnished and has an Easysleep mattress. All rooms have LCD flat-screen TVs with Freeview digital channels, integrated DVD players and radio and alarm facilities. The en suite bathrooms are tiled throughout and boast powerful high-pressure showers. A full cooked English breakfast is included in the price and includes cereal and toast with butter and jam. Tea, coffee and a selection of fruit juices are also available. Guildford town centre is just a 3-minute drive away and event venues such as Loseley Park and Gate Street Barn are close by, as are the Manor House Conference Centre and Charterhouse school. There is free on-site parking. This is a relaxed and friendly hotel, set in an ideal Surrey location and has been recently refurbished, making it an ideal venue for conference, corporate or leisure guests. The Macdonald Frimley Hall Hotel exudes a timeless air. A grand Victorian house, ivy clad and with original leaded windows, the hotel is a million miles away from the frenetic pace of modern life. A grand, ornately carved staircase leads to individually decorated rooms with original fireplaces, four-poster beds and inlaid mahogany furniture. Near Camberley's centre, this country house hotel is perfect for trips to Legoland, Windsor Castle, Ascot Racecourse, Wisley Royal Horticultural Society Gardens and Virginia Water. The new Vital Health and Beauty spa at the hotel offers a 17 metre swimming pool, techno-gym, sauna, steam room and 5 beauty treatment rooms. The Sandhurst Bar and Gold Room serve pre-dinner drinks, coffee and light snacks all day. Fully refurbished in 2008, the stylish and modern Menzies Chequers Gatwick hotel has en suite bedrooms, a lounge, bar and brasserie. The spacious lounge at Menzies Chequers has a sleek, modern and relaxed atmosphere. 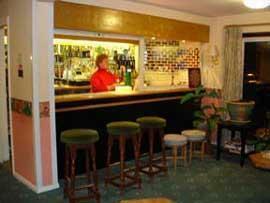 The in-house Chequers Pub offers a more traditional style. The Brasserie Restaurant offers a superb dining experience, with freshly created dishes and a wide selection of world wines. The Menzies Chequers Gatwick is close to the regions motorway network, making it ideal for airport stopovers. Fixed-rate taxis to and from Gatwick Airport can be arranged by the hotel. Half a mile (800 metres) from Gatwick Airport, the Gatwick Moat House has air-conditioned rooms with free wireless internet access. The Best Western Gatwick Moat House has a restaurant, lounge and bar serving informal food and offering 24-hour room service. Sunday late check-out is available when booking Sunday lunch. All bedrooms are non-smoking with tea/coffee, hairdryer, trouser press and Sky TV (with pay movies). 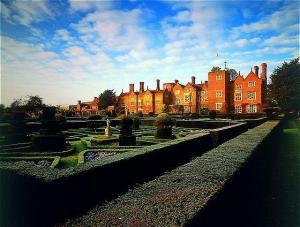 The Gatwick Moat House runs a shuttle service (additional cost) to and from the airport and train station. The Gatwick Express train leaves from the station, reaching central London in 30 minutes. The Best Western Gatwick Moat House is also within reach of Thorpe Park. Gainsborough Lodge is conveniently situated only five minutes from Gatwick Airport. An extended Edwardian House with 16 rooms and bungalow annex of 14 rooms. Family run set in half-acre garden. Long term car park available on the premises per day. We have a free phone courtesy pick up point at the airport, available from 9:00am - 11:00pm, which runs every 30 minutes on the hour & half hour when requested. A taxi is GBP 5.00 outside of these hours. Horley Town Centre is a five minute walk away and offers Indian, Italian, Spanish & Chinese food, pizza, fish & chips and four pubs. Evening meals are not provided, but guests are invited to use our Conservatory dining room for take-aways. Unfortunately, the guest house does not have a lift.